Who here is ready for a Hawaiian vacation? Srsly, I fantasize about one regularly. While an actual tropical vacation isn’t on the immediate agenda unforch, we can all light up some tiki torches, put on some luau tunes, fashion up Hawaiian-style pulled pork, and allow the island breeze (read: floor fan) take us away…I’m ready, are you? Did you know the most popular coffee in the world comes from Kona, Hawaii? I was aware of coffees presence there, but I didn’t realize just how big of a thing it was, until I recently partnered with San Francisco Bay Coffee. While the brand is headquartered in Lincoln, CA and owns six coffee farms in Latin America, it recently bought a coffee farm in Kona, Hawaii, as well as opened a gourmet coffee bar. In order to celebrate their Hawaiian perma-staycation, you could win a vacation to Kona! SF Bay has opened a sweepstakes, offering a free trip to Kona, Hawaii, where you will see their farm, learn how coffee is grown, and revel in tropical paradise! You can enter for a change to win a trip to Hawaii HERE! It legit takes 15 seconds to enter, I swear. So I kinda pulled a fast one on you…tempting you with thoughts of the tropics, when in reality you may just win big. I have high hopes, positive thoughts, and all the good jujus. Because I recently formed a partnership with SF Bay, I figured I’d take the time to give you some background – you’ll be seeing them around here in the future! First off, have you heard of them, and/or tasted their coffee? After reading about the company, I was blown away by their commitment to above-ethical business practices, sustainability, and their initiative to keep their farm workers healthy both physically and fiscally. Buckle up, because we’re about to talk sustainability and charity, two topics I’m passionate about to the point of ultimate wordiness. San Francisco Bay Coffee was founded (and is still 100% owned) by the Rogers Family in 1979. You may recognize them for their extensive line of Kirkland signature coffees available at Costco nationwide. Making it their mission to source their coffee beans responsibly and sustainably long before most companies began fair trade practices, the Rogers family has prioritized social responsibility and environmental consciousness for over two decades. They own seven coffee farms, where they sustainably grow their own coffee beans, 3 of which are in Panama, 3 in Mexico, and 1 in Hawaii (its newest acquisition). SF Bay set up the Rogers Family Charitable Fund, which donates a portion of profits each year to improve not just the farms where their coffee beans are sourced, but also the lives of those who work the farms, as well as their families. From the fund, the company has built over 50 schools, dozens of kitchens, provides hot meals to the workers and the workers families, as well as medical and dental programs at many of the farms. In addition to their continued dedication to sustainable growing and processing practices, the company has managed to increase overall productivity and quality of the final product. 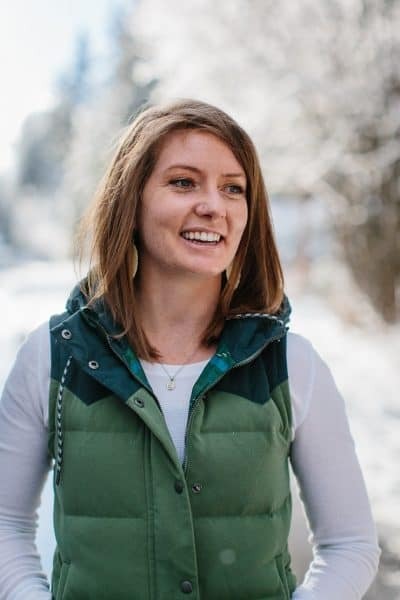 The company is currently taking on multiple environmental initiatives in order to lower their own carbon footprint as well as raising the bar for other coffee companies.You can read more about those initiatives and the The Rogers family here and here. So now you have the big picture, we can talk about things closer to home. 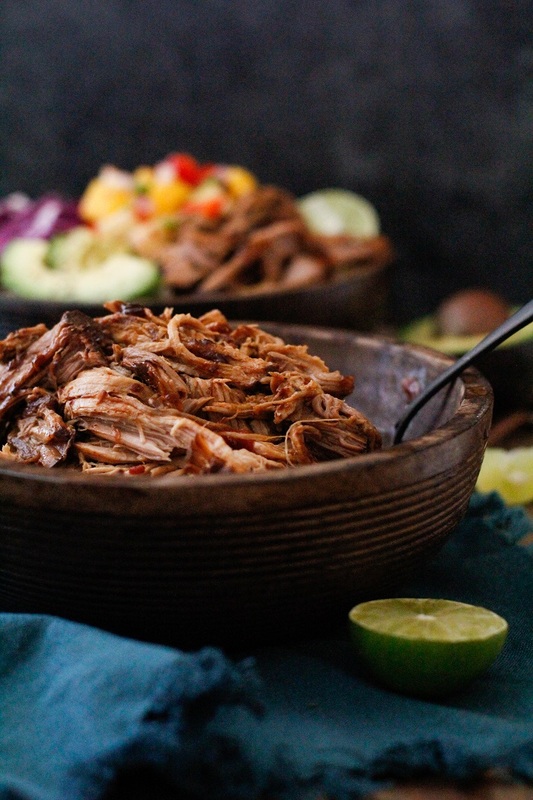 Specifically, these crock pot Hawaiian pulled pork burrito bowls. 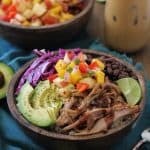 The gist of it is simple: Slow cook a pork roast overnight (or throughout the day) in a Hawaiian-inspired elixir of bliss (teriyaki sauce, coffee, salsa, honey, and pineapple juice), then assemble the most glorious burrito bowls (or burritos!) of your life. I’m going to dubstep backwards for a second and say, YES, typically authentic Hawaiian BBQ or pulled pork is made using brown sugar. YES, you can 200% use brown sugar in this recipe – simply replace the honey with ¼ cup packed dark brown sugar. I used honey to make the recipe free of refined sugar, but if you want to go full-tilt Hawaiian, you just let your hair down! 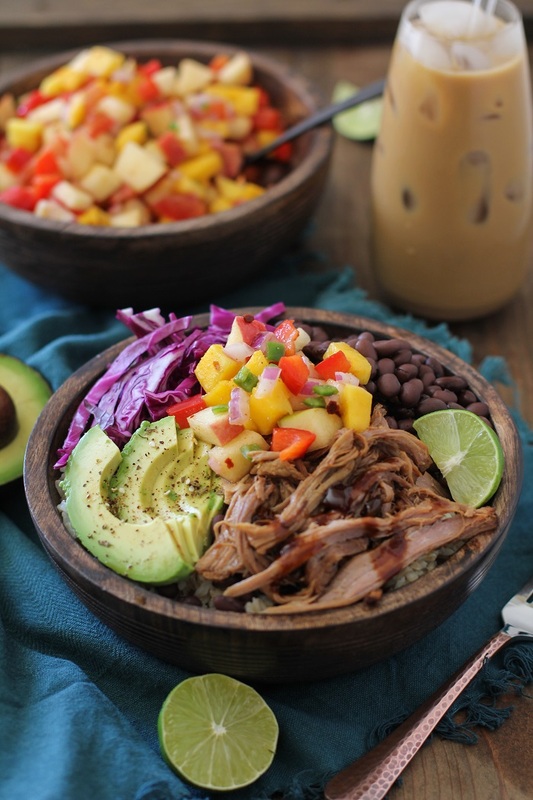 Included in the bowls are brown rice, black beans, red cabbage, avocado, and mango-apple salsa. The mango apple salsa, though, folks…do you see what I did there? Mango, because: tropical, and apple, because: pork. Pork + apple = two peas in a pod…although the bowls don’t necessarily neeeeed the salsa per se, they do. Don’tja skip it! So I’m about to tell you something that’s going to make you blow a gasket. The delicious Hawaiian porky juices left in the crock pot? In addition to letting the pork stew in the juices post-shredding, you can 200% make a sauce out of it. To do so, simply use a measuring cup to remove 1 to 1-½ cups of the sauce, then boil it in a saucepan on the stove until it thickens (about 8 minutes). It will change your world, you best believe! Because I was feeling fun and frisky, I decided to enjoy my Hawaiian pulled pork burrito bowl with a Hawaiian-style iced coffee. All I did was brew a single serving of coffee using my single-serve dispenser, mixed in a tablespoon of coconut sugar while it was still hot, then let it cool. Poured it over ice with some full-fat coconut milk, et viola! Amazing island coffee. Enter to win a trip to Hawaii HERE! Heat the olive oil in a medium skillet over medium-high heat. Add the chopped onion and saute, stirring occasionally, until onion begins to brown, about 10 to 15 minutes. Add the garlic and continue cooking for 2 minutes. Transfer the sauteed onion/garlic to your slow cooker, along with the salsa. Place the pork shoulder on top of the onions and salsa in your slow cooker. Add the teriyaki sauce, brewed coffee, honey, pineapple juice, ginger, paprika, cumin, and cinnamon to a blender and blend until smooth. Pour this mixture into your slow cooker, and give the contents of the slow cooker a little stir. Secure the cover of your slow cooker and put it on the lowest setting. Cook for 8 to 12 hours. Remove the meat from the slow cooker and place it on a cutting board. Use two forks to shred the meat. (Note: If desired, remove 1 cup of the juices from the slow cooker, transfer it to a saucepan and reduce it on the stove top until thick, about 5 to 8 minutes. You can use this sauce for serving). Transfer the pulled pork back into the slow cooker with the juices and allow it to soak up more flavor for at least 20 minutes. Add all of the ingredients for the salsa to a mixing bowl and stir well to combine. Set aside until ready to use. 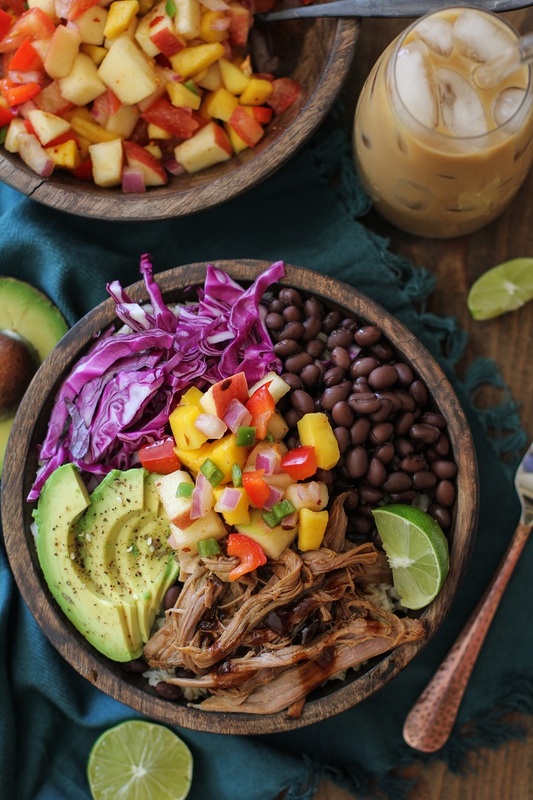 Divide rice between 5 to 6 large bowls, then add desired amount of pulled pork, beans, shredded cabbage, avocado, and mango-apple salsa to each bowl. Drizzle the reduced sauce (or sauce from the slow cooker) on top, and serve. *You can use any heat of your preference. I used a spicy store-bought tomato salsa. **I used this brand of teriyaki sauce because it is soy-free, gluten-free, and refined sugar-free. You can use any store-bought brand or homemade teriyaki. Can you freeze the meat for later use? 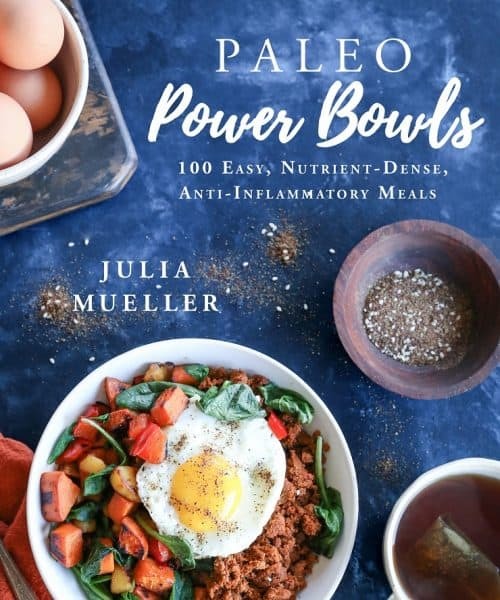 Oh my goodness these bowls look amazing! I’ll have to make them ASAP since there’s no Hawaiian vacation on my horizon either! In searching for the perfect recipe for mom’s birthday lunch, I saw this. Problem solved. She is going to love it!